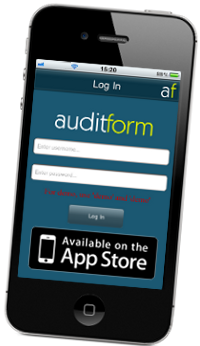 Auditform is an audit management tool. AuditForm will enable your auditors to use web based or hand-held data capture methods to carry out an audit on remote sites, and track non-compliances in real-time until the audit is successfully resolved. AuditForm handheld and internet software is designed to enable the collection of inspection data during fieldwork, giving executives and managers critical knowledge and control as well as reducing risk. Auditors increase efficiency and quality through reduced administration and a single input process. Field trials have showed that data capture using this method saves an auditor 2 days a week over using a manual method to capture and input the same data. Using a common web based process, further efficiencies can be made through the follow up and resolution of non-compliances, as well as being able to easily see and use the information for management review. Auditform reduces risk by immediately reporting non-compliances for action without transposition errors. Auditform saves time in the collecting and processing of information. Auditform saves money by enabling auditors to carry out more audits in the same amount of time. To see how we are able to help our clients with their auditing requirements, please take a look at our Speedy SHEQ case study. Use hand-held devices to conduct your audits and synchronise to make the completed audit instantly viewable online. If you would like to find out more about AuditForm please visit www.auditform.com or call us on +44(0)161 447 8845.